From abandoned to show star! Shadow is the dog on the Bark to the Future show poster. one of Dan our show producer personal dogs. At 6 months old only this little Catahula leapard was kicked out of her family home and abandoned on the street of South Florida which by the way quit common there… She was found at the intersection of a busy street after been hit by a car in middle of summer when temperature on the asphalt can reach 120F. Worst part is people were just looking at her while she was totally traumatized in shock from this bad accident. Long story short, Dan took her and after 18 months of training she became the Spoke dog of the show and on of the crowd’s favorite. Her everyday life is quit simple actually she’s staying at home with Dan, take care of Ding Ding his Australian Shepard who’s now 9 y.o with also 2 cats. She’s with Dan all the time and stick on him like glue, reason for her name ”Shadow”. 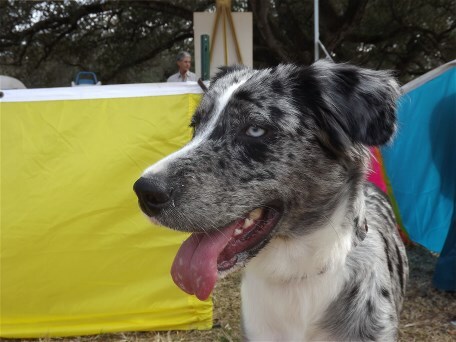 She’s now part of every training session at American Idogs training class, show, demo, interview and audition day. 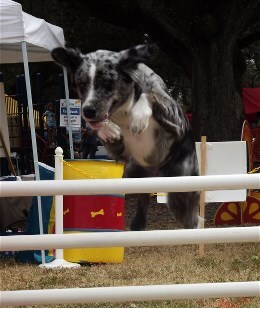 She totally love agility, lure coursing doing show and obedience. She’s also a good canine musical Freestyler a great high jumper and an excellent dog trainer. She can teach other dogs thing only another dog can do say Dan. Shadow is the leaving proof that it’s not because your dog is coming from a shelter that it can’t be a great dog! Come see a show you”ll see what we mean by that.